An easy answer to a big water treatment challenge. One of the persistent problems of water treatment is how to deal with iron in well water used for landscape irrigation. Water with iron leaves stains on buildings, sidewalks, and driveways. Although homeowners often try to cure the problem with conventional iron filters, this approach is seldom satisfactory. The problem is that iron filters have a limited capacity between regeneration sessions. If used for water inside the home, an iron filter only has to process a few hundred gallons of water per day at a moderate flow rate. The filter has time to backwash and renew itself at night. With irrigation applications, however, the filter might be required to process thousands of gallons per day at a high flow rate. Iron filters used for significant irrigation jobs work only when they are sized very large, and usually multiple filters are required so that one can be regenerated while others are in service. Treatment is done by injecting the concentrated chemical into the water line, either with an electric chemical pump or with a passive siphoning system powered by the flow of water itself. Both systems work well, but in most cases the passive system is easier and less expensive. When flow rates vary, non-electric systems are more accurate. They are also easier to set up, because they adjust automatically to changing flow. 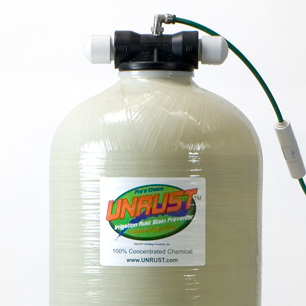 Unrust is an easy way to stop irrigation staining. It can be used to treat water with iron levels as high as 30 parts per million. Unrust is easy to install. It has no pump, needs no electricity, and needs no storage tank. With normal iron levels, the Unrust unit has a 500-hour capacity before more Unrust chemical needs to be added. Unrust Stain Preventer is added dry into the system (fertilizer can be added as well). The dry powder is automatically mixed into a concentrated solution that is fed into the water stream when the irrigation water flows through the pipe. The operation is fully automatic. The Unrust irrigation system starts and stops automatically with the flow of irrigation water. The amount of Unrust Stain Preventer added to the water automatically increases and decreases according to water flow, and the amount of treatment chemical used is controlled by a flow control that is color coded to match the amount of iron in the water. It's very easy to set up. Setup involves installing the color coded flow control that matches your iron level (no tools needed), adding Unrust Stain Preventer to the treatment tank, and turning on the water. The concentrated solution to be injected into the water line is mixed automatically by the Unrust system then fed into the irrigation water to prevent staining. Unrust Iron Stain Preventer systems are unavailable at this time.